February is National Children’s Dental Health Month! It’s the time of year when parents are encouraged to pay special attention to their children’s pearly whites, focusing on promoting good habits that will last a lifetime. Would you like to get into the spirit of this special and important annual observance? Your family dentist offers a few tips that will benefit the smiles of every member of your household. Okay, we know that going to the dentist might not be as exciting as a day at Zero Gravity Thrill Amusement Park, but it’s certainly better for everyone’s health. If it has been more than six months since your child’s last checkup, February is the perfect time to schedule an appointment for them. Before you make the appointment, though, pause a moment to think about your own dental health. You want to set a good example for your little one, don’t you? If you never see a dentist, how are they supposed to understand how important oral healthcare is? You may need to schedule a cleaning and checkup for yourself as well. Your child may be able to be in the room with you during your appointment with the same dentist that they’re going to see. 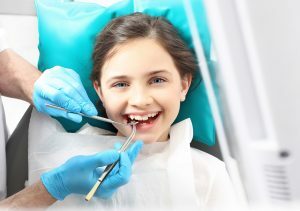 Watching how the dentist treats you and seeing Mom or Dad get their teeth cleaned can go a long way toward easing a child’s anxiety about their turn in the big chair. Life is busy. You don’t have the time to be running all over Dallas just because you see one dentist and your child sees a different one. If you have certain health conditions in which genetics are a factor, such as receding gums, soft tooth enamel, or even diabetes, your dentist can watch out for early signs of the same issues in your children. The earlier such problems are identified, the easier it is to treat them. You only have to keep track of one dentist’s policies for payments and insurance. You’ll be able to establish a trusting and friendly relationship with your dentist, which may make your family’s appointments more of a treat than they are a chore. Visiting a family dentist is extremely important, but that doesn’t mean you can let your family’s oral health fall by the wayside when you’re at home. Your dentist may offer suggestions on how you and your children can adopt better habits; make a family effort to follow those recommendations. You may need to switch to different oral hygiene products, be more diligent about flossing, cut some sugar out of the family meal plan, or adjust your brushing technique. Children’s Dental Health Month is underway. How will you make the most of it? Dr. Drew Vanderbrook is your friendly dentist in Dallas. He loves to care for patients of all ages and would be pleased to help you and your little ones enjoy healthy, beautiful smiles. If it’s time for your family’s next “Dental Day,” please contact our office at 214-821-5200.